The authors consider the processing of geometric information in the algorithms realizing the method of partial domains for treatment of internal boundary problems of electrodynamics. This procedure (preprocessor) generates a description of the cross-section of an intricate waveguide line with a priori unknown piecewise linear coordinate boundaries, which permits the use of unified matrix operators to calculate its basis. ITOH, T. (ed.). Numerical Techniques for Microwave and Millimeter-Wave Passive Structures. New York: Wiley, 1989. UHER, J.; BORNEMANN, J.; ROSENBERG, U. Waveguide Components for Antenna Feed Systems: Theory and CAD. Norwood, MA: Artech House, 1993. KISUNKO, G.V. Electro-Dynamics of Hollow Systems [in Russian]. Leningrad: Izd-vo VKAS, 1949. 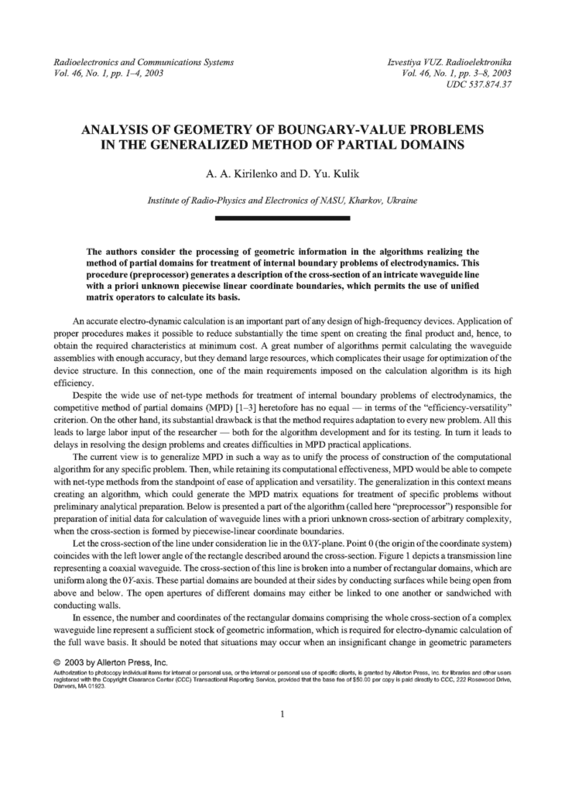 KIRILENKO, A.; KULIK, D.; PARKHOMENKO, Y.; RUD, L.; TKACHENKO, V. "Automatic electromagnetic solvers based on mode-matching, transverse resonance, and S-matrix techniques," Proc. of 14th Int. Conf. on Microwaves, Radar and Wireless Communications, 20-22 May 2002, Gdansk, Poland. IEEE, 2002, v.3, p.815-824. DOI: https://doi.org/10.1109/MIKON.2002.1017964.